We could see the house burning from our front porch, flames towering over one of our next door neighbor's houses. It was pretty scary -- and not just for the kids. We couldn't see the firefighters at all, but they'd been there a while already -- three or four large firetrucks, a bunch of other Fire Department vehicles, several ambulances, and a couple of Police cars. 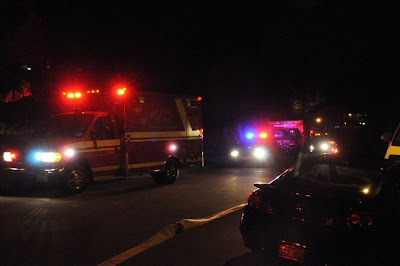 After I saw that the Fire Department was on the scene and we didn't have to evacuate immediately -- and I reassured the kids that we would be OK -- I went back in to get my camera. Here's the first shot I took through my neighbor's yard before I even set any settings on my camera (see bottom for tech notes). 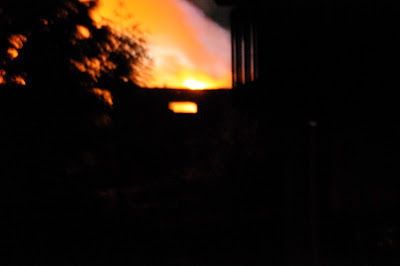 Lots of blur, but you can see the extent of the fire. After this shot, I walked around to see the fire from the other side, where the firefighters were. Here are some shots of the scene. 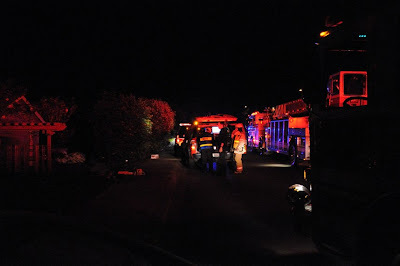 By the time I'd walked around (through a neighbor's woodsy yard in the dark), they had the fire mostly under control, but they were fighting flareups that wouldn't go away. 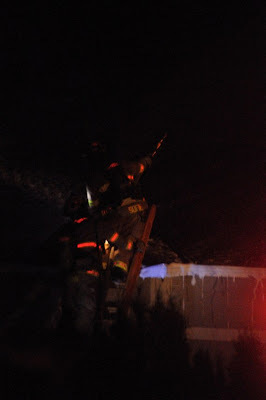 What you see dripping from the gutters is fire-retardant foam and it seemed to me that at this point, they were using both foam and water. I would have stayed around longer, but it turned out that the spot I was shooting from was the "rehab" area and firefighters showed up to use it. 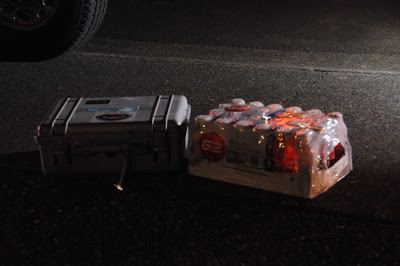 This case of K2 water should have been a good clue. So, I headed back toward our house, which is on the back side of the house in question. It did look like things were calming down. But the back of the house had a small glowing section. As we watched it, it erupted into flames. Bear in mind that wall is only 30 feet or so from one of our next door neighbor's houses, with lots of flammable material nearby. An interesting side note here -- a year and a half ago, there was a 100-foot tall cedar tree right next to the house. It fell over in a windstorm, narrowly missing two houses and crushing two cars. 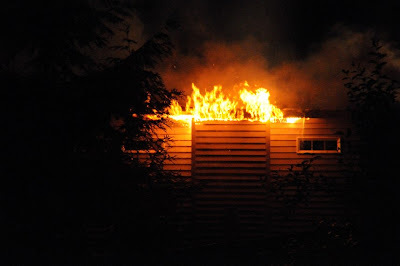 If that tree had still been there, with its branches overhanging the house, it might well have caught fire, endangering the entire neighborhood. We weren't seeing any water or foam on this section of the house, so I walked around and told a police officer doing perimeter duty what was going on, then came back. After a few minutes and still no response and the flames getting ever larger, I called 911 (the flames were actually bigger than shown here, but my shots of them are blurry). 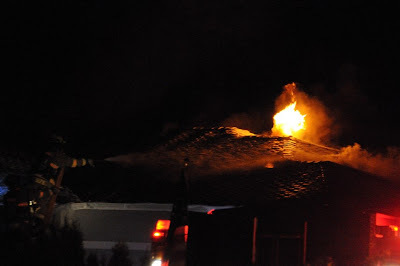 Finally, we saw water being sprayed over the house and the firefighters came around and doused these flames directly. I didn't see exactly what they were doing, but it looked like they were spraying with a smaller hose at first and then a larger one. It might have been that the smaller one was fire retardant and then they switched to higher-pressure water alone. 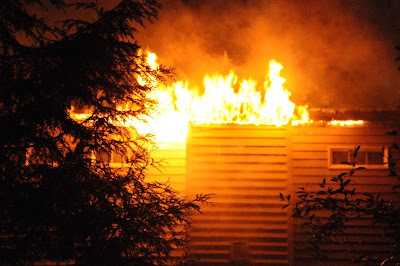 Spots kept flaring up, as if there were hot embers spread throughout the attic. Finally, when it looked like everything active was doused, we could see firefighters inside the house, spraying out through the roof. 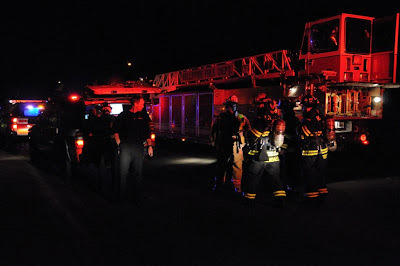 It looked like they were looking for hot spots in the attic and dousing them. At this point, I really felt like I could relax and not worry that it would turn around and endanger our house. Despite the concern over the firefighters not knowing about the flareup on our side, I really appreciate the great response. Of course, it's sad that somebody's lost their house, but the fire was confined to a single house and there was no loss of life. 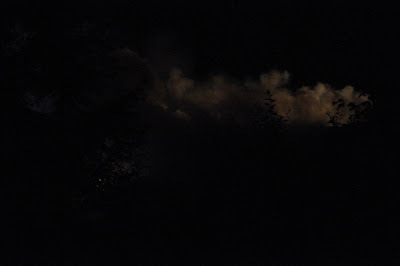 This last show shows the cloud of smoke over the house. Photo notes: The first shot was a 1/2 second exposure by mistake. After that, I switched to HI 1.0 (equivalent to ISO 6400) at 1/60th of a second, f/3.5-5.6, depending on zoom length. Lens was my 18-200 VR, which is just what happened to be on the camera. It's actually a great lens for times when you can only have one lens. Just wish it was faster. I did turn the VR on because I figured it wouldn't hurt. The auto white balance is wrong for some of these images, but I didn't spend the time yet to adjust them. And, yes, I always shoot in raw format.